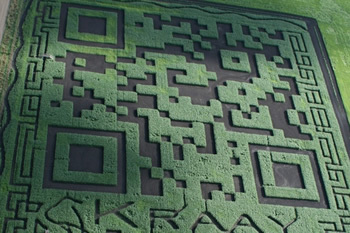 Kraay Family Farm, a Canadian-based grower nestled near the town of Lacombe, has set the world's record for creating the largest QR code ever made. If that weren't enough, what makes this QR code even more special is its composition: farmers carved out the QR code from a gigantic corn field. The Minecraftian feat covers 7 acres or about 305,000 square feet and incidentally doubles as the largest corn maze on record. The Kraay Family has been actively exploring elaborate, corn-based mazes for over 13 years. Although such terrestrial etchings can only be truly appreciated by way of aerial photography, the Kraay family has been hard at work for years, crafting yearly mazes with whimsical designs. When Kraay was asked about how he came up with the idea, he told Canadian television journalists, "I was just relaxing, reading a magazine and saw a whole bunch of QR codes and I thought, you know, it looked a whole lot like a maze I wonder if we can make one". QR codes have been gaining traction in recent years amongst advertisers and perhaps more interestingly, malware authors. Just recently, BitInstant announced an upcoming, BitCoin-funded credit card which will also include a QR code for identification purposes. The QR coding system allows for a far greater number of permutations than traditional barcodes, while up to 30 percent of the code itself can be reserved for error correction -- a feature particularly useful for damaged QR codes and inaccurate readers (i.e. cell phone cameras). The largest standard QR codes can represent up to 23,648 characters (pdf) and thus, may actually be utilized to store small amounts of data. The contents of QR codes can even be encrypted. Kraay is welcoming visitors to the nerdy agricultural attraction on September 15 for its world record party.